Office1 is now part of the RFG Eco Excellence Membership team at Ricoh. Ricoh has recognized Office1 for its commitment to eco-excellence with our customers as well as how we manage our own business and work with like-minded vendors and partners. We are especially proud to have been recognized for our excellent track record and long-standing commitment to provide customers with education, awareness and guidance on how to achieve an environmentally sustainable office. With its innovative programs and products that stress energy and resource conservation, Ricoh is a leader in sustainability. In fact, Ricoh was named the Energy Star Partner of the Year by the US Environmental protection Agency (EPA) in 2017. Ricoh’s commitment to significantly reducing the impact on the environment extends to the manufacturing of all its products. It produces smaller, lighter products; extends the life of parts; reuses products and parts and adopts recycled materials using recyclable resources. Being part of the Ricoh Eco-Excellence programs gives Office1 new tools to solve customer’s workplace printing needs, reduce energy use and diminish waste. Mobile-friendly capabilities. The Secure Document Release reduces waste caused printing mistakes and provides flexibility while saving paper, toner waste and energy. 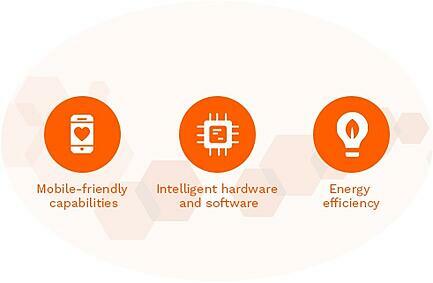 Intelligent hardware and software reduces printing costs. Even something as simple as reminding employees on their computer screens that using less paper helps reduce the carbon footprint saves money. And print jobs tied to a PIN code authentication prevent waste and add accountability. Energy efficiency. Ricoh’s Mobile Friendly Printer (MFPs) leverages energy efficiency by allowing printing from legacy host systems. Digital proofing also helps reduce unnecessary printing, saving as much as 30% in print costs. Office1 has a complete eco- and budget-friendly line of products that lessen impacts on land and water and reduces air pollution. Refurbished or like-new products not only save money but also help reduce waste and pollution. Centralized printers. We encourage all firms to create office workflows around this principle. Electronic faxing. Office1 only faxes electronically and we help our clients find the eFax solutions for their needs. All our business technology expertise means Office1 employees are best prepared to help its customers achieve eco-excellence. Modernized MFPs from Ricoh also save energy with unique technologies like Quick Start up, energy efficient toners and low-sleep mode electricity consumption. With Ricoh’s support program, Office1 also helps its customer recycle equipment, toner and supplies with a take-back program. And it’s not just limited to our supplies. Office1 can analyze customer’s existing channels to see how they can improve operations and achieve sustainability. There are also programs that help recycle with Ricoh. This is just part of our commitment to environmental sustainability. Creating a sustainable workplace helps the bottom line of any business while also contributing to a better future for the planet. Sustainable workplaces reduce the carbon footprint but they can also make for more efficient and productive work environments, which improve communications and reduce costs. For example, video collaborations between remote offices bring people together to share information and improve team-building without the burden of expensive and time-consuming travel. This will play an even greater role in the office of the future. By 2020, it’s expected that 50% of the workforce will be working from non-traditional locations. Digital presentations transform conference spaces while reducing discarded handouts. 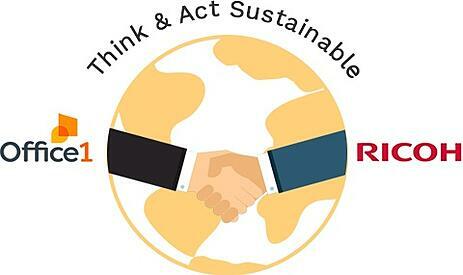 Office1 is proud to be part of the Ricoh Eco-Excellence team. We are committed to the motto, “Think & Act Sustainable.” It’s not only good for the environment but also good for the bottom line.